There’s nothing unusual about the Brockets. Boring, respectable and fiercely proud of it, Alistair and Eleanor Brocket turn up their noses at anyone strange or different. But from the moment Barnaby Brocket comes into the world, it’s clear he’s anything but normal. To the horror and shame of his parents, Barnaby appears to defy the laws of gravity – and floats. 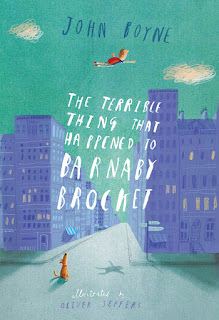 Little Barnaby is a lonely child – after all, it’s hard to make friends when you’re ten feet in the air. Desperate to please his parents, he does his best to stop floating, but he just can’t do it. Then, one fateful day, Barnaby’s mother decides enough is enough. She never asked for a weird, abnormal, floating child. She’s sick and tired of the newspapers prying and the neighbours gossiping. Barnaby has to go . . . Betrayed, frightened and alone, Barnaby floats into the path of a very special hot air balloon. And so begins a magical journey around the world; from South America to New York, Canada to Ireland, and even a trip into space, Barnaby meets a cast of truly extraordinary new friends and realises that nothing can make you happier than just being yourself.